White metal design Traditional heart shape bowl. Home decorative Traditional white metal heart shape bowl. white metallic design and designed glass. Traditional table decorative heart shape bowl. Minimum order quantity - more than 5 pieces required. 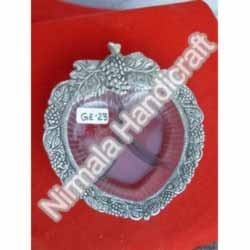 We are one of the reputed organization engaged in providing superior quality White Metal Bowl with Tray These Decorative Items are good demand in the market due to high quality and durability. These products are available in market at competitive rates. Backed by rich industry experience and market understanding, we are involved in offering a wide array of White Metal Bowl Set to our valued patrons. It is a designer glass bowl available in many different colours with lid and base beautifully handcrafted with white metal Glass Bowl. You can place it on your dining table to increase the beauty of your dining area. It is a beautiful gift to be given to your family and friends. 3 Pcs Silver Plated 4 Bowls, 3 Spoons and 1 Tray. Bowl dimension in inch: 4 x 4 x 1.5. Spoon length: 5. Tray dimension in inch: 13 x 5 x 1.75. Spoon length: 5. Made from Fine Quality Pure Brass. Ideal for Diwali Gifts, Dhanteras Shopping and Corporate Gifts. White Metal Duck Bowl With Spoon Decorative Handicrafts. 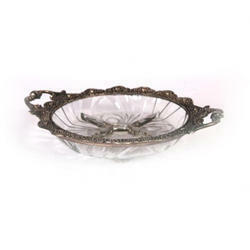 A beautiful crafted white metal bowl in the shape of swan. It is a very handy item for your home use as it can be used for different purposes. Moreover this brilliant piece of art will certainly improve your kitchen décor. Available in various colours these bowls are a smart thing to gift your loved ones. Made using best quality material, the White Metal offered by us is precisely designed and are obtainable to the clients at budget-friendly price.